Courtesy of Robert Ghrist. From the chapter 2: differentiation. Penn mathematics professor Robert Ghrist has a crazy idea: get students to actually read their calculus textbooks. And he just might succeed. 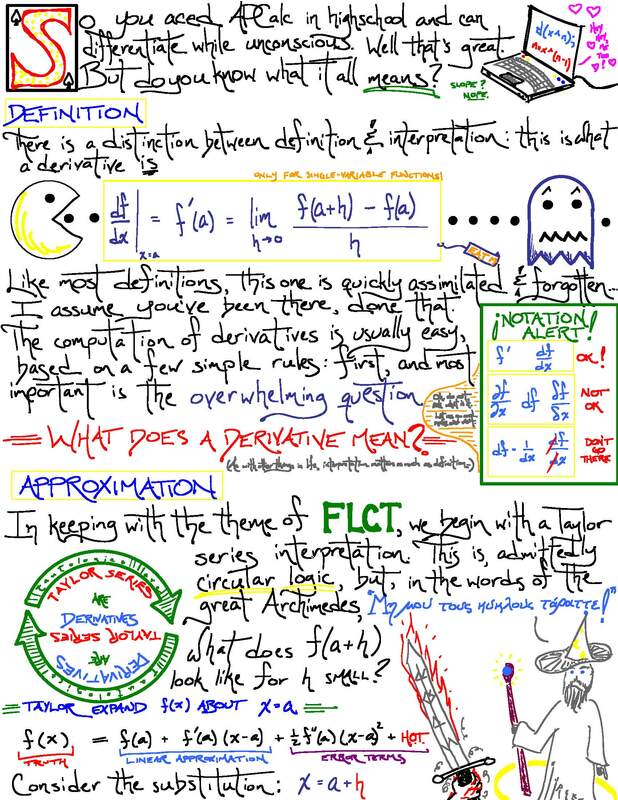 Ghrist is the creator of Funny Little Calculus Text, a hand-drawn online guide to calculus that keeps things – well, short and funny. Each chapter is chock-full of drawings, doodles and references to everything from Pacman to Santa to Virgil to Shakespeare. In fact, FLCT began as a way to help his freshman calculus students better understand the concepts behind the math. Unfortunately, Ghrist noted, most calculus textbooks tend to put people to sleep. He drew up the first chapters of FLCT on his tablet PC and posted them online for his students to review. The book is hand written, “So that it won’t look anything like a normal calculus text,” Ghrist explains. But soon students, teachers and autodidacts from everywhere began noticing Ghrist’s work. FLCT gained prominence on the social news website Reddit, and Ghrist began getting a steady steam on emails from fans. “Maybe I’ve found something that works for people,” Ghrist says. You can read for yourselves at Ghrist’s website. Because if there’s one person who can convince you that math is fun – it’s Ghrist. “We don’t really give the impression of being like Indiana Jones,” he trails off. “Maybe I shouldn’t complete that sentence,” Ghrist smiles.